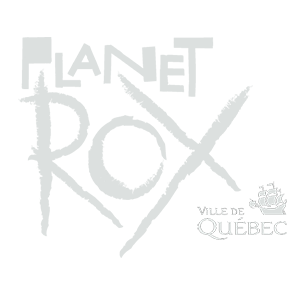 Each participating band must register online at planetrox.ca. Each band send the link one of their original songs. A panel of international industry judges will choose the 5 finalists from the songs submitted. The 5 finalists will perform live at the finals in London and an audience vote (25%) combined with the panel of industry judges’ vote (75%) will determine the winning band. Bands must have a minimum of 2 and a maximum of 6 members. The band must have never produced a CD with a professional company. The prize includes two live performances of 20 minutes on the indoor stages of the Envol et Macadam Festival 2018, airfares for the winning band members (6,250 CND maximum budget is available – flight/travel costs that exceed this amount are the responsibility of the band) plus internal travel to the hotel from the airport, four-star accommodation in central Quebec City for 4 nights, free pass for the Festival and promotion of your band in festival communications. In the Final of each country, the jury (75%) and the audience votes (25%) will select the winning band. In the event that the winning band in the National Final can not be present at the festival in September (they must notify PLANETROX before August 1 2018) their position will be offered to the band who finished in 2nd place in the National Final. The organizers will provide a sound and lighting system, which all the bands can use. The organizers will provide during the entire competition the basic equipment needed (six-piece drum kits with 3 crash, 1 ride and 1 hi-hat, a bass amplifier, two guitar amplifiers, microphones and monitors). The organizers will provide sound and lighting engineers as well as all necessary stage crew. Band members will bring any personal instruments (guitars, bass, keyboards, effect pedals, turntables, etc.). Drummers will bring their own bass drum pedal and drumsticks. All bands must use the same backline and drums provided by Envol et Macadam. Keyboards and any special equipment – other than personal instruments – will be placed on stage before the concert begins and will remain there until the end of the concert. To keep changeover times to a minimum, any band with a left-handed drummer will play either first or last on the bill. All bands must follow instructions given by the organizers and the appointed stage manager. It is not permitted to use pre-recorded sound material (except for sequencers). All bands must play live. Cover versions are not permitted. All songs must be original although not necessarily written by the band themselves. The total playing time for each band will be of 20 minutes. Pyrotechnics are not allowed. Any band overrunning their allotted playing time can be penalized (deducted points) or disqualified. The playing order of the bands will be determined by a draw. There will be a panel of judges at the National Finale but audience vote will count for 25% of the final vote. The audience can vote using a voting slip. The judges’ vote (three people) will count for 75% of the final vote. If there is a tie, the judges’ choice will be given precedence. There will be no sound check in National Finale, except for the first band to play on stage. Any band that misses their allotted onstage time is liable to be disqualified. All bands taking part in the festival, if possible, be given a 10-minute sound check. Sound checks will be allotted in reverse order to the running order. Which means the band last on stage does the first sound check and the band first on stage does the last sound check. Times for sound checks and onstage times will be given to each band. Onstage time given : 20 minutes. If any band misses their allotted sound check or onstage slot in the festival, the organizers will make all efforts to fit them in elsewhere. However, if this is not possible the band is liable to do not participate. The prize must be accepted as such and cannot be traded, sold or transferred. No substitutions will be allowed. The winner will release PLANETROX and its respective directors, partners, affiliates, officers and employees from any liability for any damage or loss arising from participation in the competition or from the awarding and acceptance of the prize. If unable to supply the prize as described herein PLANETROX reserves the right to substitute all or part of the prize or prizes with a prize or prizes of comparable value. The refusal to accept the prize releases PLANETROX from any liability or obligation. Any false statement by a participant will see them automatically disqualified from the competition. PLANETROX assumes no liability resulting from losses, delays, mistaken addresses or undelivered mail, printing errors, technical malfunctions, computer or telephone, damage to software or computer equipment, fraudulent calls or any other error. PLANETROX and its respective directors, partners, affiliates, officers and employees assume no liability of any nature whatsoever in any case where their inability to act resulting from an event or situation unforeseeable or beyond their control, including strikes, lockouts or other labor disputes at their location or the locations of the organizations or companies whose services are used for this contest. Participation in this contest signifies the participant’s full acceptance of these rules. All decisions and judgments by PLANETROX are final.